Although it was late at night (and still a couple hours from being considered morning) I was feeling breakfast for some reason. Thus, I ordered the chilaquiles, which I like to think of as breakfast nachos. These came with pork in a thick red sauce, along with red chips, eggs, cheese and beans. I was very excited to dig into them, but within the first few bites I was simply disappointed. I couldn’t point to any particular reason why I was disappointed. All the ingredients were there, but there just didn’t seem to be anything to them. It was like they just didn’t want to be there, and thus I didn’t really want to eat them. If I could point to anything, it might be that there was a very high egg to everything else ratio. 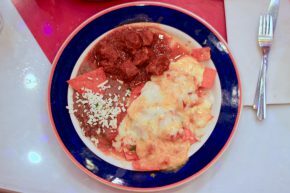 I’m sure Mi Tierra does other things better than they do chilaquiles, but since that’s all I ate, it’s really all I can go off of. Plus, I can’t imagine there are a ton of other 24 hour spots in San Antonio and when you look at it through that lens you could do a whole lot worse.